"A dragon created from the soul of a wicked knight." When I got the e-mail for this week's Card of the Days and saw "Serpent Knight Dragon", I knew that (A) Lord Tranorix picked this week's cards, and (B) he would make out with a Serpent Night Dragon if he could...well, maybe not that far, but it's the only reason that this card made it to CotD. A lot of people say they want to ask Konami "Why??" when Yata was made. I want to ask Konami "Why??" when they decided to make this card a Secret Rare. Summoned Skull was already released as a Starter Deck Common at this point, and Dark Magician and BEWD were already out as well. 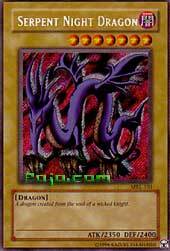 Even in a Dragon deck, you have much better support than this card could give you. Spear Dragon, Tyrant Dragon...if you wanted to play Dragons at the time this card was out, you were playing the Lord of D + 2 Blue-Eyes White Dragon combo. There's no specific cards that work with Serpent Night Dragon, no great combos, nothing that another card with the same tributing requirements can't already do better. Today we're reviewing the utterly awesome Serpent Night Dragon, a Secret Rare from Magic Ruler and one of Rex Raptor's Staples. The stats: 2350 ATK is enough to take out just about any monster your opponent can throw at you, and in a direct attack it will knock out over 1/4 of his LP; 2400 DEF is enough to defend against most threats. The effect: There is none. What does this mean? He’s 100% unaffected by Skill Drain! Use Cost Down and he's only one tribute. Use Double Ghoston (coming next set) and he's only one tribute. He's DARK; that means Chaos food. He’s a Dragon; that means he has an amazing number of support cards. Is there any reason not to run this?